While we were busy conducting the National Talent Acquisition Test last month in Navi Mumbai, we came across a problem that undergraduates faced, that of Resumes. We had asked the students to submit both hard copies and soft copies of their resume to us while giving the test but we had a lot of students coming up to us and asking us for tips on how to create a resume. While we did solve their queries, we realized that maybe we should do a blog post in order to aid all the students on Switch Idea as well. So this blog post will help you understand how to create a functional resume which can help you get noticed better during internship/job applications. A Resume or C.V (Curriculum Vitae) is a brief description of yourself in terms of education, abilities and your objectives. It helps give employers quite a bit of insight about you as an applicant. What should a Resume contain? While there is no fixed format as such for all industries, there are some fixed sections that every resume should have. Your educational qualifications starting from your 10th grade onwards. Areas of the subject that you are interested in professionally. Your work experience, in this case, internship or project details. Other skills and hobbies which can aid you in your professional journey. Here are some things to keep in mind while creating your resume. It is normal to want to pour your heart out into your resume because you feel that you should put everything that you have done into it. That is good but you should also put yourself in the shoes of the HR manager whose job it is to sort through the 100 or so resumes they get whenever they have an opening. They do not have the time to go through all that you have written in order to understand you better. They will end up comparing the data that you have put in your resume to the actual job requirements at hand and then shortlisting the best possible candidates. So let go of long sentences and detailed explanations. Write simple sentences and be as brief as possible. Go through the job description and the requirements and only put in information that is necessary for the job at hand. Remove the rest. If you do it properly, then your resume should fit in exactly one page. Make sure that your resume stands out in the bunch. This can be done in a number of ways. 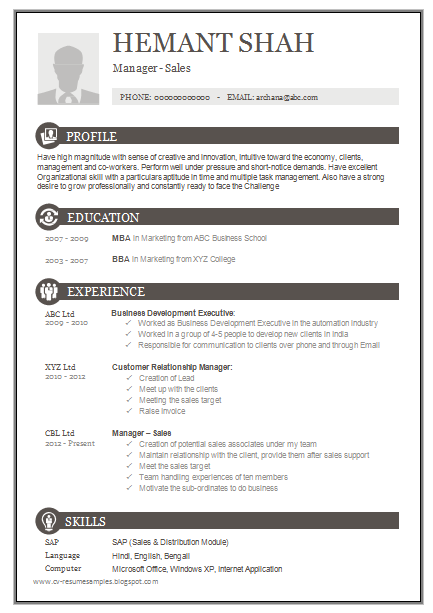 You can do an infographic based resume which is pleasing to look at. You can also create a professional text resume with great fonts and a good typeset. These may seem like trivial things but they do have great impact upon employers. Resumes like these mean that you have a creative bent, a clear thinking mind and that you understand the art of presentation. All good traits to possess for an aspiring young professional-to-be. It is definitely easy for anyone to exaggerate their abilities and skills while writing something down on a document. Make sure that you only write those things that you can back up during an actual interview. Do not get carried away while making your resume. Understand that being honest is actually a good thing when you are looking to gain the trust of a potential employer. In a competitive environment, it is normal to try to get an edge above others but do not use this as an excuse to embellish your resume or overstate your abilities as they can actually be bad for you in an interview. Here are some examples of resumes which you can take as a reference for yours. Before Applying For A Job, Evaluate If You Are Job Ready!